Since last year, we have been eagerly awaiting to see the glimpse of Kangana Ranaut playing the warrior queen. The actress announced her ambitious project, Manikarnika – The Queen of Jhansi almost a year and half ago. While she started shooting for the film last year, the film is currently wrapping up some final yet major sequences. 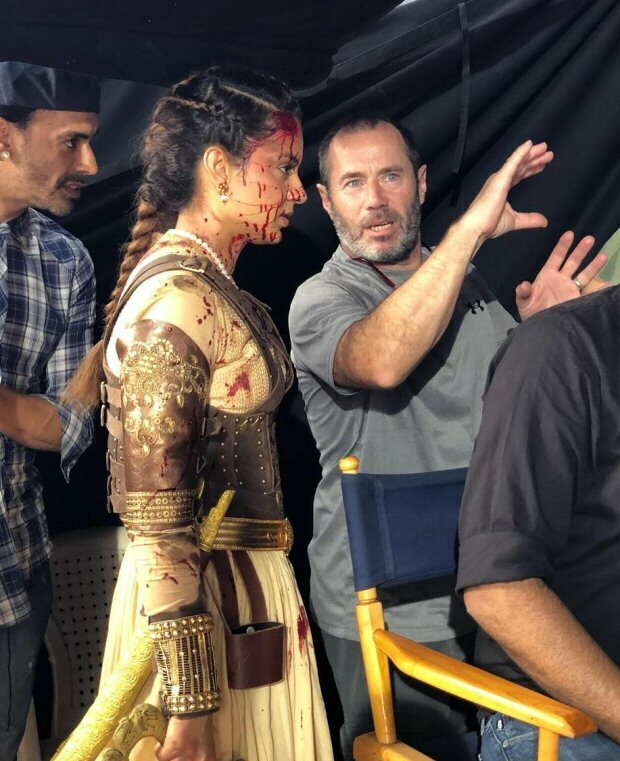 Today, a picture of Kangana as Rani Laxmibai started doing the rounds on the internet, where she looks worn and battered. If the picture is anything to go by, it seems that it was clicked in between the shot that featured Kangana Ranaut. The actress seems to be oozing out blood and it looks like she was shooting a rigorous war sequence. Not just that, even her costume she has adorned for this particular picture is an indication that she has walked right out of a war sequence. As for the picture, the actress seems to be keenly involved in the instructions that are being given to her by the famous action director Nick Powell. Coming to Manikarnika – The Queen of Jhansi, the film, we hear has been facing several delays owing to its grandeur and the effects required. Last we heard that some portions of the film are being considered for reshooting because the film has turned out to be different from the script that was approved. Also, the makers are keen on exploring the personal struggles of Manikarnika aka Rani Laxmibai a little more in detail in the film. Owing to the same, it is being said that a schedule of 40 days is being planned to shoot the necessary portions and the team has apparently received a green signal from the producers Zee Studios for the same. As for Manikarnika – The Queen of Jhansi, the film is directed by Krish but now we hear that Kangana has taken over the directorial reigns because the filmmaker has given time to his next, NTR biopic. Written by KV Vijayendra Prasad, who has also written the blockbuster Baahubali, Manikarnika also stars Ankita Lokhande, and Jisshu Sengupta amongst others.